Joe Biden, the current Democratic primary front-runner according to most polls, is well aware of the Obama bubble: the phenomenon of party voters favoring the former vice-president because of his association with one of the most popular Democratic leaders in recent history. He’s so aware, in fact, that according to a report from the Associated Press, the nascent Biden campaign intends to lean heavily on Obama’s legacy in an attempt to rebuild the coalition that brought him two sturdy Electoral College wins. It’s more or less the expected move from the former vice-president, invoking the name of a highly popular centrist in a time when policy proposals from 2020 contenders like Elizabeth Warren and Bernie Sanders are pushing the Party to the left. According to a recent Pew survey of registered Democrats, 53 percent said they want the party to pursue a “more moderate direction,” while 40 percent preferred the more liberal politics that emerged in the wake of the 2016 election. More numbers in Biden’s favor come from a recent Morning Consult poll, which states he’s the second choice of Bernie Sanders supporters, Kamala Harris supporters, and Beto O’Rourke supporters, suggesting the broad, if secondary appeal of the former vice-president. Perhaps the best argument for a Biden ticket is the possibility of reclaiming working-class Obama-Trump voters for the Democratic Party. According to a Harvard-Harris poll from February, three out of four voters who said they’d back a Biden run don’t have a college education. The same poll states he’s winning 42 percent of non-college-educated voters, 20 points more than his closest competitor, Bernie Sanders. The ex-veep may pull out the “Obama-Biden Democrat” calling card more frequently in the coming weeks, which is a bit odd, as the Associated Press notes. 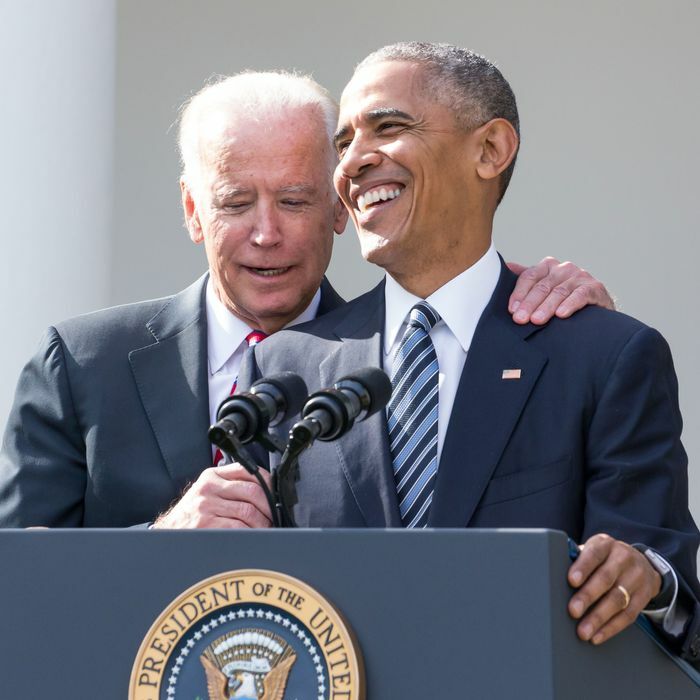 A while back, Obama and Biden reportedly agreed that the former president wouldn’t skew the odds by backing a primary candidate. Thus, the “Obama-Biden Democrat” claim doesn’t have the full support of its most important player.